China has reportedly developed a new type of electronic warfare aircraft with extra antenna installations. A military expert said that it would gather intelligence on whatever comes near the South China Sea and East China Sea to gain an advantage in case of conflict. A photo of the aircraft was featured in a China Central Television (CCTV) report on Wednesday, which called the warplane "a new type of special mission aircraft," without giving an exact designation. The aircraft appears to have been developed from the Y-9, Wei Dongxu, a Beijing-based military analyst, told the Global Times on Thursday. 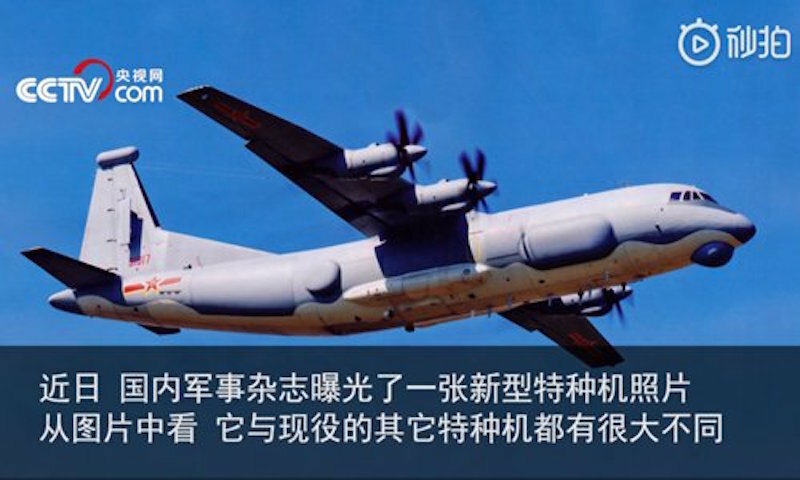 The Y-9, a medium-sized tactical transport plane with a maximum range of about 4,000 kilometers, has been modified, including as early warning aircraft, reconnaissance plane and anti-submarine aircraft, CCTV reported in 2018. But the new variation is unlike the others: It has what seems to be a hemispheric radar dome under its chin, two large antennas on each side of the plane, an antenna on each side of the tailfin and an electronic warfare pod on top of the tailfin. The devices on the plane mean it could effectively monitor enemies' radio communication and intercept their radar signals, Wei said. It can also deliver electronic suppression, supporting China's aerial strike units by jamming and paralyzing hostile air defense systems, the report said. However, Wei believes that the aggressive role is better left to electronic warfare aircraft modified from a fighter jet instead of from a transport plane, because the latter is more vulnerable and flies slower. One important role the new aircraft could play is to gather intelligence and electronic data in the South China Sea and East China Sea on whatever comes near, according to Wei. With the pre-knowledge of hostile electronic signals, China can launch pointed electronic suppression and jamming in case of a conflict, which brings a significant advantage, he said. The new aircraft could replace the GX-4, an older electronic warfare plane developed from the Y-8 transport plane, because the Y-9 platform can fly longer and carry more devices, experts said. An airplane with the same traits was photographed years ago, but was grounded and painted yellow, which usually means it was in development. Military observers called it the GX-11.